Victory goes to the brave. Chrysler's Charger is the winner of the WHEELS Car Of The Year Award, the most important award made to the Australian motor industry. Charger fits the ideal behind the award - to encourage manufactures to make a genuine contribution to motor engineering standards in Australia. And to make this car a courageous move indeed. Chrysler already has a two-door hardtop and adding the Charger as a smaller coupe would seem only to be complicating their range. But Chrysler took a gamble - and the Charger has succeeded outstandingly because it is an entirely different car. It had proven that it is possible to have an excitingly styled body and yet still have a fully practical car to carry five people. With a wide range of models and highly competitive prices, it brings sporty flair within the reach of thousands of people who would never considered buying a two-door car. For this is very much a car for Mr and Mrs Average Australian. Apart from its good looks and comfortable interior, it is also a very good and safe handler ... an excellent all round car. But what about the other cars that were eligible for this year's award? The HQ Holden was obviously the Charger's biggest competitor, but on the road it didn't fulfil the potential of it many engineering advances. Our opinion of the HQ's many and varied models is firm - to us it is an enigma of the year. Of the others, the Cortina TC came closest. It lost out because it was designed in England and developed in Germany - or was it the other way around? A number of detail changes were made for Australia, but none of them was of a major nature. It is still a pleasing motor car, a concept that makes excellent sense to so many people. 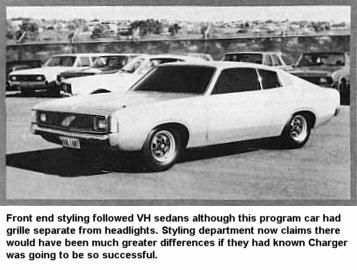 The story begins in the last week of November, 1969, when Chrysler Managing Director David Brown, Chief Engineer Walt MacPherson and an American product planner saw the final mock-ups of the VH sedan, then almost two years away from the release. Then David Brown asked the vital question; "Well, we've blanketed the big car market with our VH range, but isn't something missing ... even with Pacer, are we ignoring the youth market?" What was needed was something different, something which would grab the attention of the young buyers who at this time were tuning from the Valiant to the opposition sporty coupes or high performance V8s. The idea of a smaller Valiant in coupe form developed from this meeting. Looking through the then and projected new car lists, Malcolm Holman, Chrysler's Product Planning Manager, decided there was nothing such a car would compete with. Closest was the Fiat 124 coupe, but on a local sales volume of 400 per year it would hardly be economic for Chrysler to produce a new model in those quantities. A direct parallel could be drawn with the Ford Mustang. Conceived out of a Falcon to compete with the sporty Chevrolet Corvair Corsair, the Mustang began a new trend. It was much more than just a two-door version of the Falcon. It started at a low price and went up in both performance and price with a model for everybody. Charger was going to do the same thing. A practical four/five seater with the compact external dimensions and the maximum possible interior room, it was to use much of the VH Valiant as possible but at the same time it had to establish an independant image and style of its own. The decision was taken to go ahead with "The 29 Car", as the Charger was then known, and this was relayed to the United States. On January 25, 1970, Bob Hubbach, a Chrysler stylist, arrived with some rough drawings of the projected car. Taking short cuts everywhere, Chrysler rushed through the styling, although you'd never pick it looking at the finished product. They had to rush because the car was intended to arrive on the market at the same time as the VH which had been virtually "locked-in" in June 1968. Luckily, the car styled by Hubbach and Brian Smyth, the local styling man, from the initial drawings needed little modification. It was right from the word go. Normally with a brand new car Chrysler goes through the routine of a styling mock-up, followed by a life-size model in clay from which a template is taken and the car converted into aluminium. Then a model shop reproduction in wood is made into plastic with tolerances of .005 of an inch. The final tooling is made from this. Over one weekend in April, 1970, the Charger design team went straight from the clay to the tool room by means of a computorised drafting device known as Ibis which turns a three dimensional surface into engineering drawings for tooling. At this stage, only 20 people within the company knew of the project. For most of the staff the VH range had been completed in August, 1968, when the first car was finished. Strangely, this first VH wasn't a sedan - it was one of the new long wheelbase Hardtops. It was built first because of the structural problems involved with the two-door pillarless concept. It cost $150,000. The whole Charger program was one of the best-kept secrets in the Australian motor industry. It wasn't until WHEELS first broke the story in our rundown on the VH sedans in July that the news of the short wheelbase coupe leaked out - and even we thought it was a replacement for the old Hardtop rather than a new car in its own right. Charger just wouldn't have been possible if it had not been for then intense enthusiam of the engineering and design staffs. For them, Charger was not just another Valiant but an exciting dream car. Initially, the car was intended simply to be a style leader with good performance. It wasn't until the company was well into the project that The 29 Car's competition potential showed through. 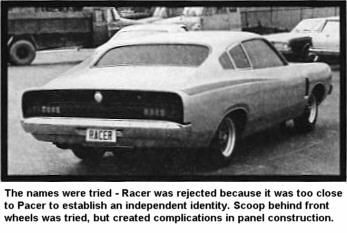 Remember, this was about the time Chrysler first made the decision to enter motor racing in the company's name. So, with this in mind, the 245 Hemi engine was then enlarged to 265 CID and the development of a racing version with Weber carbies began. This meant research in the Weber factory in Italy was necessary. To maintain secrecy about the Charger, the engine was sent over in a VG Pacer body. 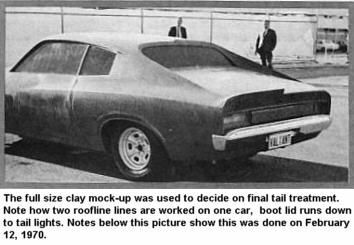 Meanwhile, after the final body shape had been decided, the detail work involved in the styling revealed some interesting examples of the extent to which Chrysler was willing to go to build a car as close to perfect as possible ... and priced low enough for everyone to own. The car was intended to have genuine flow-through ventilation. To help with research in this area, rear quarter panels from a 1966 Mustang were flown out to Australia for evaluation. That particular Mustang had flow-through vents, but because of problems with a reverse flow of air which sent exhaust gases into the interior it was dropped for the '67 model. With the Charger prototypes Chrysler experienced the same kind of troubles, together with excess noise levels, dust entry and water leaks so the idea was dropped because of lack of development time. It's the sort of modification we could expect in future models. Brian Smyth reckoned the top of the line 770 model deserved something which could give it a distinguished look - so a wide band of black vinyl runs along the waist line from the windscreen to the dummy vent area. This has the effect of lowering the belt line and reducing the stubby look of other models. The unique sports road wheels used on the 770 and R/T are also Smyth's work. Originally the hairy Chargers were going to have American wheels, but Smyth had been tinkering around with wheels, virtually in his spare time - and he just happened to have a couple of plastic replicas on hand when the American styling man was around. The wheels are now being produced by ROH in Adelaide to Smyth's design. Once styling was finished the released drawings went into engineering and the first full body to be the production forerunner (in engineers' jargon it's called the "program car") was built up. 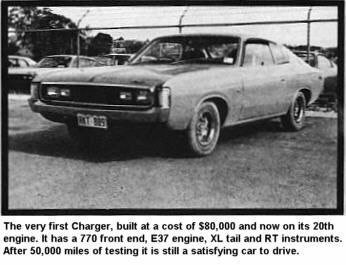 This was to become the first Charger. It was carefully handbuilt and made mobile in August, 1970, one year before the production cars went on sale. To build, this first car cost $80,000. Now that it's all over, it looks like any other Charger, but if you get close enough you'll notice the 770 front, XL tail, R/T instruments and the sports road wheels. Meanwhile, as the body engineers put the shell together, component prototype testing (engines, transmissions, brakes, suspension, steering, handling and ride) was being done with the bits fitted into VG utes which had been suitably shortened to a 105 inch wheelbase to duplicate the dimensions of the Charger. They were pounded day and night for months. The information gained was then transferred back to the program vehicle which for security reasons wasn't allowed out of the holy-of-holies Experimental Operations Garage at Tonsley Park. Finally, Chris Michelmore and Ken Paddick, the vehicle engineers in charge of development, were able to take the program Charger for its first run. It felt so good they came back convinced there was little more to be done. This car now runs an E37 engine (the road version of the Weber carburettored 265 CID engines available) but the engineers can't remember exactly how many engines have been fired in anger under its bonnet. It's either 19 or 20 and it has had them all - V8, 245, 265 and six-pack. As it turned out, 90 percent of the work done with the utes was switched across to the program Charger without needing modification. Since then, the first Charger has survived 50,000 miles of outback testing, run up at the rate of 3000 miles a week with the test drivers taking three eight-hour shifts. It also had a 12-hour non-stop endurance run at Mallala with Leo Geoghegan behind the wheel. After all this, the program car still drives just like any other Charger - smooth, clean through the gears, taut, responsive and surprisingly comfortable. Suspension changes were the most significant modifications made to the Charger compared to the VH sedans. The rear leaf springs were shortened by two inches to 53 inches and their spring rates increased from 115 lb per inch to 120 lb per inch. At the front the torsion bar diameter was increased from .85 inch to .87 inch on the Chargers. That doesn't sound very much, but it significantly increases the strength of the bar because the spring rate of a torsion bar increases to the fourth power of any increase in diameter. Slightly stronger shockers completed the picture. All told, the handling of the Charger was measurably improved over the sedan. It had the tight, precise feel lacking in the big car. With greater roll stiffness and less weight transfer, the Chargers became superbly stable and ideal for high speed touring - particularly the 770 and R/T which get the front anti-roll bar. The bar also had the hidden advantage of tightening up the steering. We'd like to see it on the base models too, but they can be fitted with the roll bar kit plus new lower control arms obtainable from a Chrysler dealer. The advantages are well worthwhile. According to vehicle evaluation engineer Harry Aust, the Charger is set-up to understeer for road use, but by using the upper rear mounting holes for the suspension, as on the E38, it can easily be made to oversteer. Strangely, the E38 on the race track understeers on left handers and oversteers on righthand bends. Stiffer rear springs cure the problem, although just why it happens remains a mystery. Engineering toyed with the idea of using a rear anti-roll bar, but any benefit achieved by it could be had simply by raising the counting points of the rear springs. Finally, the first car was ready for the baptism of fire. Managing Director David Brown took it out in secret one night in January, 1971. Ken Paddick and Chris Michelmore were with him, holding their breath. But then, a series of grins from Brown and the 80 mph average ended the engineers' worries. The final go-ahead was given. By the time the car finally came off the production line, it owed Chrysler just $2 million, one tenth of the amount spent of the development of the VH range. And Charger's $2 million is the best spent money Chrysler accountants have even had to approve. It has been a stunning sales success over a wide price range. Not surprisingly, a break-down of the models shows there are plenty of buyers searhcing for a practical five-seater with an exciting appearance. In its first full month of selling 32 percent of Chargers were the XL ($3195), 28 percent the base model ($2795), 23 percent the 770 ($3625) and 17 percent the R/T ($3395). This base model appeal is the secret of its success. If it had been aimed solely at the high performance market, the Charger would still be regarded as a phenomenal success, but the volume necessary to justify the low pricing wouldn't exist. Of the R/T models, 30 percent are the full race E38 and 11 percent the milder E37, while 20 percent of the 770s came with the E37 engine. And although there is supposed to be a trend away from the matt black panels and striping, 76 percent of R/T owners took up the striping option. For Chrysler itself, the car is doing even better than sales figures indicate. The only Chrysler model the Charger really cuts across is the Pacer - most of the rest of the buyers are conquest sales from Holden and Ford and they are the best sales of all. Continuing the theme of low cost, all but the 770 V8 and R/T models are in insurance Category 1, so it is possible to buy an XL with 203 bhp, or a 770 with the six-pack engine and suitable performance and still get next to cheapest insurance rates. On the service side, Chrysler has made a real contribution to low-cost motoring by reducing servicing requirements to a level below the Holden Kingswood. Charger goes in for a service every 4000 miles after a free 1000 mile check-up, while all Holdens need the grease gun every 3000 miles. Over a 12,000 mile period, the Charger servicing, including labor, oil filters and oil, works out to $51.25. The Holden, over the same distance, costs $58.44. And body panels and popular replacement parts such as fan belts and globes are priced below the Holden in many instances ... proof that being different isn't necessarily going to send you broke. If the Charger has any faults they are compromises in a highly desirable package rather than inherent mechanical faults. It has enormous appeal as a low-priced family car and yet it appeals just as strongly to the man looking for a genuine high performance, touring car. To date, we've picked a market trend-setter every year for the WHEELS Car Of The Year - and the Charger could be the biggest success yet. It is Chrysler's second COTY - the first in 1967 was for the VE Valiant - and one of the most deserving in the history of the award. Charger has won the award because of its great versatility, its pricing, its styling and practicality - and the very real engineering advances which have been made in road behaviour. Quite simply, it is a very good car indeed.